Miriam, what do you do with the asiatic day flower? My front flower bed is covered up with the stuff, despite all my efforts to pull it. Steam the whole aerial part gently, then add it to a frying pan where you've sauteed thick slices of garlic in olive oil or butter. Sprinkle salt, a little white pepper, and the slightest bit of dried thyme a over the whole. Also simple, and a way that lets you taste the delicate string-beanish flavor of the dayflower, is to steam it and mix lightly toasted, blanched and split almonds into the dish. Maybe add a drop of olive oil. Salt to taste. Drop a small handful of the beautiful blue flowers onto a cucumber salad. If you really have that many, steam a whole lot for 10 minutes; put them aside. Make a roux based on whatever stock you have in hand, or on milk; season it and put it in a baking dish. Lay the cooked dayflower vegetables on top and poke them down into the sauce a bit. Cover with a light layer of breadcrumbs, dot with butter or drizzle olive oil over all. If you wish, grate a sharp cheese over the dish. Pop it into the oven and bake 15 minutes. Serve with rice. I've heard people say that if you add enough cheese and breadcrumbs, any wild herb will taste good. It's a little embarrassing to admit that's true. A pasta sauce: Saute a medium-sized onion, sliced into rings, in the oil of choice (mine is always olive); add two large, peeled, chopped tomatoes and a bay leaf and saute till you have a thickish mess. If it looks like its drying out, add a little white wine. Add a crushed garlic clove or two, and salt. Grind some black pepper into it. Add 1/2 cup or your dayflower veg, chopped into lengths about 2 inches, and keep cooking gently till it's cooked through. When the sauce is ready, mix it into hot pasta and serve. Or just chop them up and add them to soup. I wish I had your dayflower trouble. There are so many more yellow flowers than blue, the dayflowers are a rest and a delight to the eye. I have always been fascinated by providing ones own sustenance, hand foraged goodies from the wild and edible discoveries always seem to taste better than any other. Please tell us what your favorite foraged item is in your part of the world. Where and when do you find it? What is your most beloved way of preparing it? Which one, when found, gives you chills of delight? What is the most elusive prize? Morels: when in the Pacific Northwest were both my favorite and most elusive find. Huckleberries: Again in the PNW. Deliciousness, eaten directly from the bush! I can't wait to discover what wonders await me in my new home in the south! Blackberries and Dewberries in the south. Wild strawberries in the south. Dandelion greens in the south. Yes, Huckleberries as well. Ramps (ick, but Dad was fond of them for some unfathomable reason). Bream and Crappie (does fishing equate to foraging?). Although my mother managed to domesticate two trees, keeping us in jelly. Fiddleheads are not hard to find in the south, though it depends upon how woodsy the area is you are located in. Wild violets, Grandma made a salad. Yum, I forgot fiddleheads. I saute mine in butter with chopped garlic and S&P. What is a Mayhaw and how is it used? When I grew up in Indiana every spring we would find yellow morels, which we called "pecker head" morels. My fondest memory of my dad was him coming back from a trip to Minnesota with the back of a pick up truck full of trash bags stuffed with morels. We would dust them with flour and fry them in butter and sprinkle them with salt. My mom couldn't cook them fast enough. When I moved to the Berkshires in western Mass. I worked at Wheatleigh and we would find hude cepes on the grounds of the hotel. We also had a dream patch of ramps. I like both just simpley grilled with a steak or a peice of fish. I have since moved to Germany, and unfortunatly, here in Berlin, there are not to many wilds growing. Although, I was lucky enough to go to the Black Forest a couple of weeks ago and we were picking wild strawberries around Hinterzarten. We just ate them natural. When I stumbled appon that bunch of ramps my heart was pounding with excitment. Not that finding mushrooms isn't great. It's just that I grew up with them, the ramps were a new find for me. That was probably my favorite day foraging. It is a hawthorn (very like a crabapple), actually, that grows in swampy areas. Wonderful jelly. Don't buy any off the shelf, though, you'll be dissappointed. You really must forage and make it yourself. Here's a link to some ideas. I have noticed before that the general theme among those that love to forage seems to be "childhood memories". My own can be linked to fond memories of foraging in Alaska with my mother or grandmother. Hunting for lowbush blueberries while keeping an eye on the bears close by doing the same. Making highbush cranberry jelly from the buckets we gathered earlier in the day. Searching for Corel mushrooms to fry with the fresh caught Salmon or Rabbit from the mornings outing. Gathering wild rhubarb and tiny strawberries for a pie.........."sigh". I take my 3 sons with me on the hunt for Morels and such, and they love the thrill of it as much as I do. Kpzachary..............Did you say "trash bags full of Morels?" OMG!!!! They would have had to bury me in a very large piano box the next day! I lived in Edinburgh for the last seven years, where I led a fairly typical urbanite life (i.e. supermarkets, delis, farmers markets). Since I moved back home just under a year ago, I've been enjoying my forageing trips again enormously. I've been forageing for various wild mushrooms (see here and here or Flickr photos). This year was the first year to find yellow morels - it hadn't just occured to us to look for mushrooms in spring. Then there's wild greens: nettles (good in soups), ground elder/Bishops weed (first time I used this, turned into a delicious Greek-style hortapita pie), dandelion greens (salads), wild garlic (great in spring salads!). My uncle collects maple sap and birch sap - does that count? And finally, there's lots of wild berries. I'm forageing for wild strawberries (see here and here), cloudberries (see here), as well as bog blueberries, cranberries, lingonberries. pille..........It is so fascinating to see the differences and similarities of wild food across the world. Thank you! I will have to see if wild garlic grows here. And yes, maple syrup counts! Realy counts!!! Anything gathered from the wild with your own two hands and keen eyes, then eaten with pleasure, would qualify as foraging in my book. Yes Annecros........I would Never leave out fish of any sort! Absolutely! Kids make great foragers, and it is a great bonding exercise for them. Educational - my parents and grandparents would tell me so many stories about their parents and grandparents, a quiet time to talk about serious issues, teaching a child about how to identify edibles and what to stay away from (there are rattlesnakes in blackberry bushes - trust me, you also get to see a water moccasin in a mayhaw bog from time to time), a great way to get the kids off their butts and outdoors to burn some energy. I am so grateful that my kids were around my father before he died, and got to take those walks in the woods with him. Yeah for you on the nut trees! I bet you can't wait for October/November! Put those kids to work! If you have a boggy area, chances are you may have, or can cultivate, a mayhaw tree with all that hardwood around. Oh, and don't forget, those nut woods make great smoking chips as well. Pecan is my favorite on pork. I used to pick blackberries outside of my house in san francisco (my family lived in persidio) when I was very young. I'd pick a TON and my mom would make jam and blackberry pie. Then we moved to virginia and we had lots and lots of wild garlic in our front yard that I would dig up. I loved to smell my fingers afterwards and give the find to my mom for kimchiing (is that a word?). Now that Im older and I live in massachusetts, I see blackberries all the time. I try to pick some, but my boyfriend always freaks out and thinks I'm going to die. Hey, I make sure I don't pick any near any roads and I haven't gotten sick or died yet. There is a sort of cultural phobia of germs some people have against foraging. If they could only see the warehouses, and containers, and back storerooms where the food is stored and transported before it is wrapped up in plastic and a green tray, they would be in the woods in a minute! Then there is the field the foods are grown in, that happens to be outdoors and regularly sprayed with fungicide and pesticide and water from a shallow well. The easiest for me at this time is the Miner's lettuce and wild black berries that grow in back of my house. No blackberries this year as the rains stopped too soon. We used to get morels when we lived farther up in the mountains although I've never found any at this elevation. Used to get a lot of field mushrooms too but our favorite spots have been built over. Tell me about wintergreen berries, are they the same thing as wintergreen flavoring? Do they grow other places? When and where do you find them and how do you use them? I've heard reference to a lot of wild greens around here, such as poke and skunk cabbage. I realy enjoyed the greens that I have tried in the past, cultivated, and would like to try foraged wild ones. What greens grow in what areas and how do you prepair them? Of course, there are dandilions Everywhere, and I have tried chickweed also. 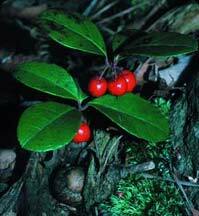 Wintergreen is easy to find and makes and the leaves makes a lovely tea. It does take time to seep a refreshing drink. When walking in the woods, I usually find them in acidic soil, on the edge of evergreens and in the shade. The leaves are glossy and the fruit is usually better in the winter time. The tea is made with fresh leaves (not dried) and fermented. The fermenting brings out a stronger flavour. Please note that wintergreen should not be consumed by those that are sensitive to aspirin (it was once used as medicine). We live in a forager's paradise in my part of the PNW. Huckleberries by the gallon, Nordstrom shopping bags full of chanterelles, wild strawberries as big as the tip of your thumb. My friend's parents own a piece of land that they logged in order to pay for her college tuition, and, as avid morel hunters know, morels love disturbed ground. We haul sacks of morels out of there every year. We are also lucky to live in an area with lots of abandoned orchards, particularly prune-plum orchards. Prunes are not susceptible to pests, so bushels of unblemished prunes are free for the taking, and make the most delicious, tangy dried prunes imaginable, completely unlike those plump black things in the supermarket. Of course, there are also lots of other things to forage, but these are the ones that we go after in quantity. Also, a word to the wise: Morels and booze don't mix! David Arora of Mushrooms Demystified fame says that morels contain small quantities of rocket fuel, which, when combined with alcohol, will induce vomiting. I passed this bit of information along to my husband as he prepared to pour himself a Maker's Mark while I cooked our morel-heavy dinner. He scoffed, he poured, and he ate, then spent the next three hours projectile vomiting while I stifled the urge to say "I told you so!" I grew up picking mulberries, wild raspberries, blackberries and mulberries (climbing the trees to get them and returning home with ink-stained feet that would remain so for weeks) growing up. Nowadays I like to gather daylilly buds and sautee them quickly with a little oil and S&P, sometimes add into a pasta dish. I'm fascinated by foraging, though, and want to learn a lot more about it. If anyone can recommend a great book or other resource for foraging in the Mid-Atlantic, I'd be grateful. All sorts of wild herbs and edibles out there. Recently I learned that the Queen Anne's Lace that growns along all our roadsides is the progenitor of the modern carrot. Its blossoms are also useful as an herb, but it's apparently quite important to identify the plant correctly, for it closely resembles the deadly water hemlock (which also grows in abundance around here). I've heard there are many culinary uses for cattails, but I've never tried them. I wonder if my green tomato hornworm experiment from a few years back is considered foraging? On that note, the marshes around my father's house are loaded with periwinkles, which I hear are cherished in other parts of the world. One time in Ocean City, Md. I used a plastic colander to sieve sand for a few hours until I'd filled it over halfway with coquinas, which I used to make a light and flavorful broth for sipping. Let's keep this thread alive. I am in Southern California. This year greens were a bust as we had no rain to speak of. I am finding wild fennel in the canyons and it is a great bed for fish or chicken. There are a number of volunteer trees in the canyons and at my local closed landfill which after 30 years has a park-like quality. Loquats were really flavorful this year, and I stained a few t-shirts picking mulberries from the one tree I found hiding behind a rubber tree. The berry patches in the more inaccessible canyons are looking possible and tend not to be stripped when you go back to check on them since they are a pain to get to. The mint that appears each spring in the lost space beween my house and my neighbors finds itself in Thai salads among other things. I too want to learn more, having been inspired by fifi's posts and blogs. She left a great legacy. I learned about various edible wild plants when going on nature walks as a 13-year-old at French Woods Camp on the upper Delaware, near Calicoon and Hancock, New York. Our leader, a 16-year-old counselor, explained to us that the way to tell the difference between Queen Anne's lace and hemlock was that the root of the former, when dug up, smell sweet and subtly carrot-like, while the roots of the latter smell bitter. If that's incorrect or inadequate, I know someone will correct it. One other useful bit of knowledge I retained from the nature walks is how to recognize wood sorrel. The somewhat clover-looking wood sorrel grows all over the place and is tangy and tasty. Surprisingly enough, I even found some growing at the doorstep of my old girlfriend's mother's house on the East Coast of Malaysia, where no-one knew the plant was edible (I picked some and ate it and offered her some, but she declined), although many wild plants are gathered there (an activity I often took part in as a child there). The nature walks were a lot of fun, and we always ate some food. I remember eating things from elder plants, too, and we were taught that we could eat daisy petals to stave off starvation if lost in the woods, but had to avoid the pollen. Possibly the greatest forager EVER, Euel Gibbons, wrote Stalking the Wild Asparagus and several other books about foraging for wild food. I dearly love day lily buds, sauteed with a bit of oil and soy sauce; they taste like snow peas. Totally yummy! Wow! I am so enjoying reading all these posts. Isn't it great how just chatting about foraging can take you back to happy times, the peacefulness of the forest, glen, beach and even city park. Realy seeing and partaking of nature, all the scents, sounds and tastes of her. Every memory shared here has put a smile on my face and a picture in my mind. Thank you, to all. There is so much more to learn, please keep sharing! srhcb..........what do you do with chokecherries? I tasted one once Yuck! chappie.........Daylilly bulbs, are these the same ones that we grow? Orange? I have seen these in the woods here, all over the place. And, please spill about the green tomato hornworm, that has gotten me very curious! Does anyone have any info on cattails? I have loads of them growing in the creek. Also what looks and tastes similar to chives.